DMI Furniture, Rue de Lyon Collection, Dimensions: 66"W x 24"D x 30"H. Weight: 248 lbs. Drop-front pull-out keyboard drawer. Three utility drawers and one file drawer. CPU cabinet. Cable accessible. Ships fully assembled. 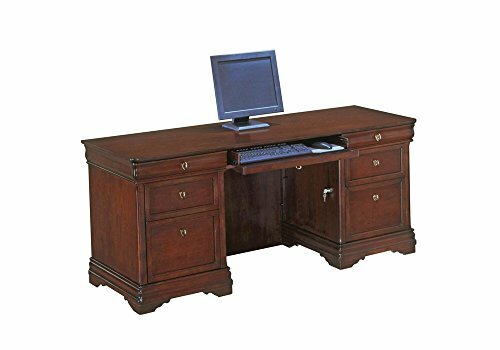 DMI Office Furniture Rue de Lyon Collection Computer Credenza is quality crafted with maple solids, select hardwood detailing and American cherry veneers. Tower computer cabinet (15W x 22-1/2"D x 19-1/2"H) and utility drawer are conveniently located in left pedestal. Center drawer is a drop-front panel, revealing a pull-out keyboard shelf. Right pedestal offers two utility drawers and one file drawer. Back of credenza is stained, but not fully finished.Complete with built-in pathways for computer cables. Ships fully assembled.